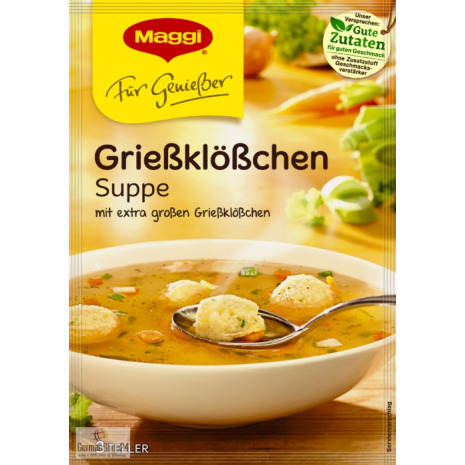 A fine spicy, clear soup with extra large semolina dumplings. Stir the content of this package with a wooden spoon in 3 1/4 cups of boiling water. Cook over medium heat for 10 minutes. Then cover and allow to stand for another 10 minutes. 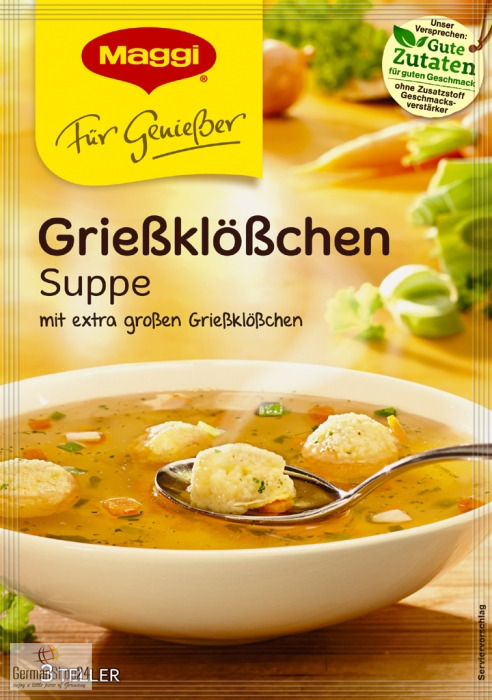 76.6% semolina dumplings (WHEAT FLOUR, palm fat, EGG PROTEIN, EGG YOLK, iodized salt, WHEAT FLOUR, sugar, nutmeg), iodized salt, yeast extract, vegetables (1.2% carrots, CELERY, onions, leek), starch, flavors, sugar, palm fat, parsley, spices, salt, seasoning (from WHEAT), maltodextrin. May contain traces of milk, soy and mustard. 76.6% Grießklößchen (WEIZENGRIESS, Palmfett, HÜHNEREI-EIWEISS, EIGELB, Jodsalz, WEIZENMEHL, Zucker, Muskatnuss), Jodsalz, Hefeextrakt, Gemüse (1.2% Karotten, SELLERIE, Zwiebeln, Lauch), Stärke, Aromen, Zucker, Palmfett, Petersilie, Gewürze, Salz, Würze (aus WEIZEN), Maltodextrin.